Help, I lost a Gunpla part! What do I do now? In early September, I was working on my Mobile Fighter G-Gundam model for a new tutorial. But I had barely started assembly before I realized a problem—I was missing his little red chin. It’s my fault, of course. In the interest of creating a very organized metallic marker painting tutorial, I cleaned a little too much as I went. Somewhere between cutting the pieces out, washing them for painting, and drying them, that tiny red nub went out with the trash. The chin may be tiny, but it’s a striking part of the Gundam’s face and would definitely be noticeable if it was missing. I needed to get it, and digging through my apartment complex’s dumpster was not an option I wanted to pursue. What I ended up doing was re-ordering the same kit off of Amazon. Since it was available on Prime, it got delivered to me within 24 hours of my order. So I was able to pretty much continue my kit building uninterrupted. This worked for me because the kit was relatively cheap. I didn’t mind spending an extra $15 to correct my stupid mistake. And since I was doing a painting tutorial, I appreciated having a full set of extra parts to experiment my painting techniques on. I ended up using a lot more of the kit than just the missing chin—I also repainted most of the booster pack, too. The downside, of course, is that this is sort of wasteful. I had a lot of parts I didn’t end up using and couldn’t turn into an entire kit. So there are other options, too. Used all four of this part because the gold paint bled! A much more straightforward approach would have been for me to order ONLY the chin. There are a few ways I could have done this. Gundam Store and More allows people to order a single missing Gunpla part for just $2.50 per part ($5 if it’s a weapon or accessory) plus $2.95 for shipping. For me, that would have been only $5.45 to replace the chin. The shipping time only takes a week on average. Of course, it’s a little more work on my end. I would have had to look up the part on Gundam Store and More to make sure they had it in stock, then list the exact sprue letter and part number. Actually, Gundam Store and More doesn’t have the model I was missing a part from in stock! I don’t have to panic yet because the store says I can email them to double check, but that does mean it’ll take longer than a week to get my part delivered, in any case. Another option might have been to get my individual part replaced through Bluefin, for free! All Bluefin requires is that I send a photo of the Bluefin sticker on the side of the box, so Bluefin can verify I’m using one of their kits. That was easy enough to find, and if you’re in North America it should be similarly easy for you, too, since most Bandai kits over here are distributed through Bluefin. Unfortunately, Bluefin has suspended their part replacement service at the time I’m writing this blog post at the end of 2016. I’ll update if they start doing it again. The best case scenario would have been if I was located in Japan. Bandai will replace lost or missing kit parts domestically—you just tell them what you’re missing. Sure, this isn’t a very comforting option once you’ve already lost the part. But now that this has happened to me, I’m going to make darn sure it doesn’t happen again. First, I’m going to throw away NOTHING until the model is assembled. Not sprues, not the cardboard box, not little nubs of plastic on the floor. Until the model is put together, I’ll keep anything and everything. Second, I’m going to store stuff better. If I’m painting and waiting for things to dry, I can put it in individual bowls by color or part (like all the parts for the legs) so I don’t lose any pieces. Third, I’m going to get better with super glue and hobby putty so I can repair broken or damaged pieces if the part breaks later on. 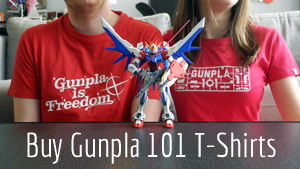 Here’s to a better Gunpla building experience from now on!